SuperEnalotto is the most popular lottery in Italy and has been played since 3 December 1997. The draw happens three times a week every Tuesday, Thursday and Saturday at 19:00 GMT. The odds of winning the jackpot are among the lowest in the world. However, this lottery also offers the highest jackpot in the world since jackpots grow very high because there is no cap in jackpot and no roll down of jackpots either. And the best part is that, winnings are not taxed. Jackpot winners have the option to receive their winnings in lump sum or annuity payment. 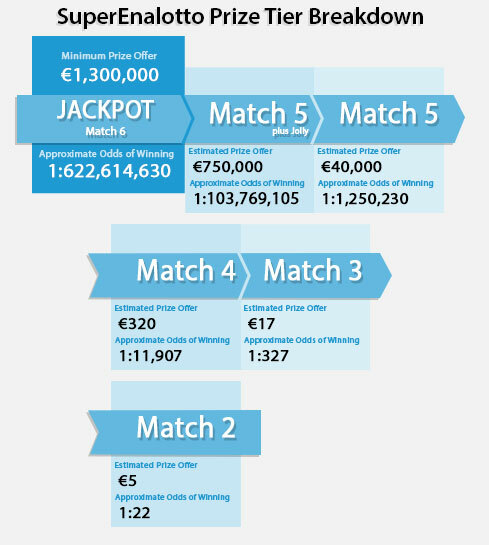 Largest single-ticket jackpot winning up to date is €177.7 million which was won by a syndicate of 70 winners. To win the jackpot, your ticket must match the 6 main numbers drawn by the SuperEnalotto lottery officials. An additional bonus ball called “Jolly Number” is also drawn. This number is significant only for players who match 5 numbers to win the 2nd prize category. Choose 6 main numbers from 1-90 or use our "Lucky Pick" random number generator to choose for you. Choose your draw days – Tuesday, Thursday or Saturday or play for ALL draw days. There are total of 5 prize categories offered when playing SuperEnalotto. To win the jackpot, you must match all 6 drawn numbers. The table below shows the full breakdown of SuperEnalotto winning prize tiers, including the approximate odds of winning and estimated prize amount.